The Skinny: Horror icons collide in this long-awaited "team-up" movie from Ronny Yu. The result? Bloody good. When John Woo, Tsui Hark, and Ringo Lam made their Hollywood debuts, they all had to endure a peculiar trial of fire: working with Jean-Claude Van Damme. For whatever reason, Ronny Yu avoided that pitfall, but eventually stepped into what could have been worse: working with a puppet. After helming the children's movie Warriors of Virtue, Yu went on to directof all thingsBride of Chucky, the fourth installment of the Child's Play series, starring everyone's favorite homicidal doll, Chucky. Many likely thought that the film would be a turning point in Yu's American film career, but probably only a few guessed that it would become a turn for the better. Bride of Chucky garnered mixed critical and fan reaction, but Ronny Yu did okay for himself. Apparently his take on the long-running horror franchise and the film's respectable box office haul gave New Line Cinema enough confidence to think Yu was just the man to resurrect two other slasher movie icons: Freddy Krueger and Jason Voorhees. So what happens when the director of The Bride with White Hair gets a decent budget, big studio backing, and the freedom to play around with the Nightmare on Elm Street and Friday the 13th franchises? A surprisingly entertaining slasher flick, that's what happens. Back on the Elm Street of an unnamed city, the townsfolk have made Freddy Krueger (Robert Englund) a taboo subject. No one mentions him, his name is expunged from the public record, and any kid who had even the slightest bit of knowledge about the gruesome killer was drugged and institutionalized. Consequently, Freddy Krueger has lost his power, because as the film explains, he lives on fear. With no teenagers who even know his name, Freddy grows weak because he cannot inspire fear. To solve his problem, Freddy delves into the subconscious of Jason Voorhees (Ken Kirzinger), the indestructible mass murderer who occupies Camp Crystal Lake, carving up campers when a sequel demands it. Jason is in a state of hibernation, presumably due to the events of Jason Goes to Hell (Jason X could take place AFTER Freddy vs. Jason, but try not to think too hard about it, okay?). Pretending to be Jason's dead mother, Freddy convinces the hockey-masked freak to rise from the grave and pay a visit to Elm Street. If Jason does some killing, Freddy reasons, then perhaps someone will let slip the Krueger name, and then the nightmares on Elm Street can resume once more. True to form, Jason does his killing, but to Freddy's dismay, the masked man doesn't stop. And from then on it's a frenetic, balls-to-the-wall, battle to end all battles between the gruesome twosome. Oh, and somewhere in all that mayhem some teenagers help move the plot along. But who really cares about them? Nobody goes to see Freddy vs. Jason for character development. With the benefit of hindsight, one has to wonder why this film floundered in limbo for so long. 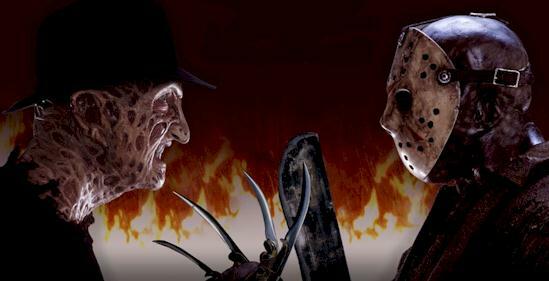 Freddy vs. Jason is a project that has been in the works ever since New Line Cinema acquired the rights to the Jason Voorhees character from Paramount Pictures. In 1993 further fuel was added to the speculation fire when Freddy Krueger's gloved hand made a surprise cameo appearance in the ninth Friday the 13th movie, Jason Goes to Hell. From that point onward, horror film aficionados were chomping at the bit for a film that would finally pit the two homicidal legends in a bout of immortal combat, but year after year, the project never materialized. In 2003, after one additional Freddy movie, four more Jason movies, numerous script rewrites and several false starts, the long overdue team-up flick finally came to pass with Ronny Yu in the director's chair. Now, if I were in a bad mood, I could really tear this movie a new one. I could say that the movie contains entirely too much exposition with way too many scenes of characters over-explaining the plot for the viewer's "benefit" (even Freddy does this once!). And if I wanted to be really mean I could rip on the laughably bad acting of nearly all the main players with Destiny's Child bandmate Kelly Rowland being the main offender. But I'm not in a bad mood, so I won't do that. Instead I will say that Freddy vs. Jason delivers on the promise of its title. Whoever came up with the idea of crafting Freddy and Jason as elemental opposites of fire and waterFreddy was burned, Jason drowneddeserves a pat on the back. It's a nice touch that's simple, effective, but not belabored like so many of the other plot points in the film. While Ken Kirzinger does a fine job with Jason (there's not much to critique with a mute killing machine), Robert Englund steals the show. Englund turns in a fantastic performance as Freddy, and is able to remain scary while still eliciting chuckles, even from some of the occasionally weak one-liners. The final conflict works like a WWE heavyweight title match crossed with the high flying action of any wuxia-style Hong Kong flick, and thankfully it's done in a way that won't make you roll your eyes in disgust (Romeo Must Die, anyone?). Really, this review could have been limited to one sentence: the final fight itself is worth the price of admission that is, if you care for that sort of thing. Notes:  Reportedly, Ronny Yu chose the winner of the climactic showdown.  Numerous references to previous installments of the Friday the 13th and A Nightmare on Elm Street franchises pervade this film.  Originally, Freddy was set to meet Jason in Friday the 13th: Part VII, but the deal fell through. Freddy was replaced with a female with telekinetic powers, which explains why some fans dub that sequel "Jason vs. Carrie."